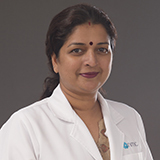 Dr. Kavitha leela Mony. a Gynaecological surgeon hails from Kerala India. She completed her M.B.B.S from the prestigious Kasturba medical college, Mangalore and M.S in Obstetrics and Gynaecology from J.S.S Medical College Mysore / RG University of Health Sciences, Then went on to do her fellowship in Minimal Access Surgery later. She then followed her educational experience working as a teaching faculty in Medical colleges in Kerala, India. She holds membership of various Obstetrics and Gynaecological societies and has attended many national and international conferences. She can communicate effectively in English, Hindi, Malayalam, Tamil and Kannada.